The straight plays are usually the weakpoint of a Stratford Festival season. With the musically minded Des McAnuff at the helm for the last few years and an untouchable legacy with Shakespeare, usually the musical and classical productions dominate. But in Antoni Cimolino’s first season as Artistic Director, the plays were stronger than ever (though, I would argue, they had nothing on this year’s excellent musicals). The two biggest hits of the year (insofar as the tiny Tom Patterson Theatre can house a hit) were Mary Stuart and Waiting for Godot. Both productions were centered on a duo of the festival’s most beloved talents. 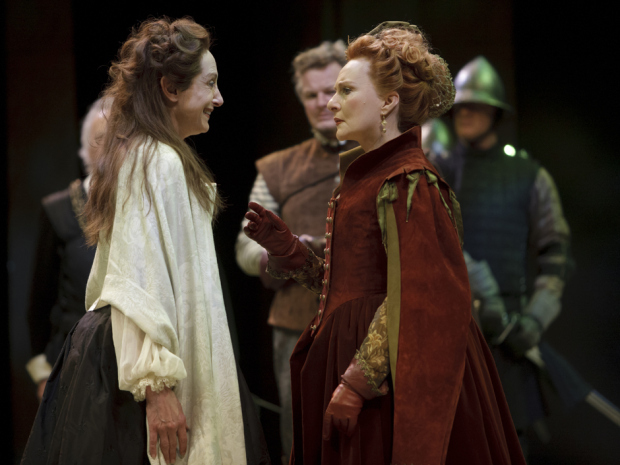 The former starred Seana McKenna as Queen Elizabeth I and Lucy Peacock as her shadowy cousin Mary (shadowy in the sense being both a little sketchy and firmly in the shadow of her legendary kinswoman). Antoni Cimolino’s period production strove to include elements of modernity but it was really just a historical fiction that rightly belonged in its own period. By imagining a meeting (that absolutely did not happen) between the two women, playwright Friedrich Schiller sets up a wild amount of potential for a climactic and complicated showdown between two women possessing more power than most women combined in the centuries on either side of them. I couldn’t help wishing for more of said showdown instead of the political maneuverings before and after it (which make up the majority of the play). McKenna and Peacock spent almost no time together onstage and, while the production was one of the season’s most popular by far, I’m sure it would have been better if they’d spent more. I could honestly have taken or left McKenna’s stiff Elizabeth, but Peacock was mesmerizing as Mary. Dark and conflicted, romantic and brusque, determined and defiant and trying not to be broken- it was one of the year’s most compelling character portraits and the star female turn at the festival. In Waiting for Godot, it was Tom Rooney and Stephen Ouimette who played the central pair; but they actually got to spend time together (almost uninterrupted). My hatred of Samuel Beckett has been well-documented, but Godot is by far his least infuriating piece. In place of Endgame’s resentment, Godot has a strong sense of kinship. If you are determined to, you can read Godot as a story about optimism instead of futile repetition. It’s still obnoxiously drab and obtuse, but at least it doesn’t hurl its audience into a pit of despair. It also helps that Rooney and Ouimette got to showcase their excellent chemistry and flawless comic timing. Teresa Przybylski’s pretty, simple, and evocative set design fit excellently within Beckett’s tyrannical specifications and director Jennifer Tarver kept the action physical enough to keep the story moving as much as the text will allow (which is admittedly not much). It was as strong a presentation as I can imagine, with even a touch of the extraordinary in the form of Randy Hughson’s Lucky, a genius portrait of pathos achieved through excruciating detail work and astounding control. I still can’t stand Beckett, but- because of Rooney, Ouimette, Tarver and, most notably, Hughson- for a few hours one August afternoon, I was able to sit with him. Though the above were touted as the great hits, my favourite play at the festival actually came in the unexpected form of Blithe Spirit. And I mean unexpected. The following is a list of people whose work I have seen and not particularly liked (or actively reviled in some cases): Noel Coward, Sara Topham, James Blendick, Seana McKenna, even, at times, Ben Carlson. 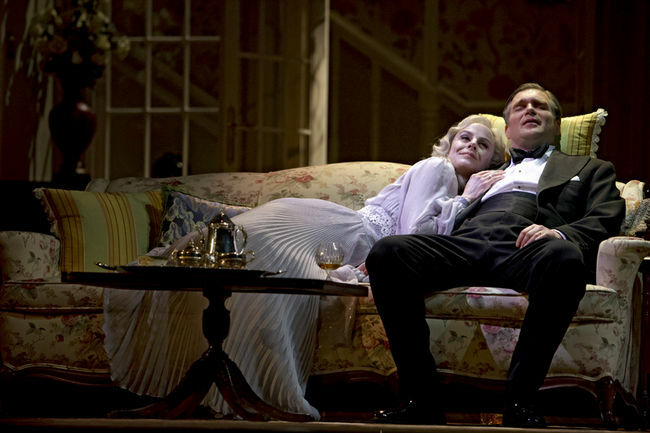 (When I saw Blithe Spirit I had yet to see Michelle Giroux in anything, but she was soon to disappoint me in The Merchant of Venice). 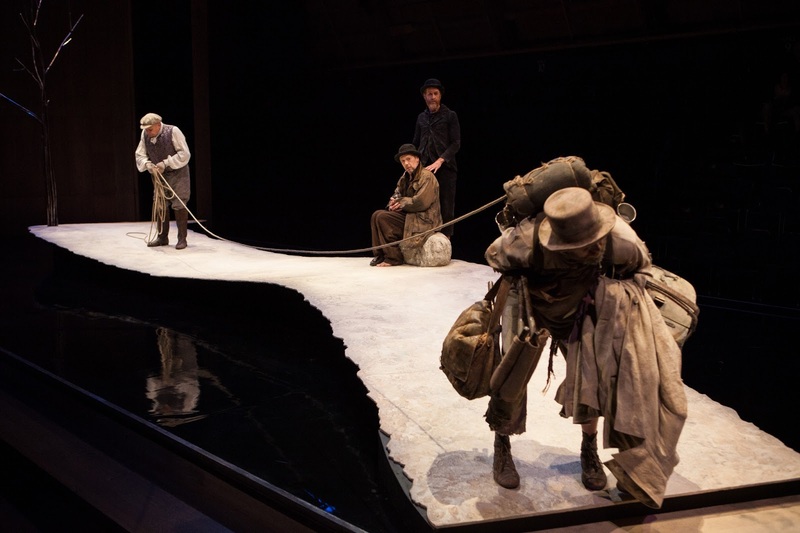 Thus, my expectations for the play in which all of these things came together on the Avon stage (the theatre that usually houses my least favourite work of the season), were through the floor. Kids, if I could give you a piece of advice- don’t be afraid of low expectations. Low expectations are awesome. They’re what got me through the Lord of the Rings musical and the movie adaptation of Les Mis and the first two acts of Gravity (they’re boring, you know they are). If I’d been expecting the moon from Blithe Spirit, who knows if I would remember it as fondly as I do. But I was expecting to hate it, so I was delighted to find myself charmed and tickled and generally cheered by this “Improbable Farce in Three Acts”about a ghostly ex-wife who wreaks havoc on a couple who just wanted to have a nice, ironic séance (for the sake of research). Coward here takes himself as un-seriously as a playwright could, and it pays off in lighthearted spades. And all of those actors I don’t particularly like? Perfectly cast across the board. In a contemporary play with a posh British accent, Sara Topham’s affectations didn’t bother me in the slightest. On the contrary, her highly specific comedic skills were actually showcased in this setting and she became one of my favourite characters on stage as Ben Carlson’s incredulous second wife. Carlson himself was charming and fun like he always is when cast appropriately and Michelle Giroux was a fantastically dry spectre. Straightforward direction by Brian Bedford with some stellar stage effects complemented Coward’s fantastically twisty and clever plot perfectly. The whole thing just worked. The final straight play of the season* was the Stratford classic The Three Musketeers. I say it’s a Stratford classic for two reasons. The first is that its last staging was a wildly successful one early in Graham Abbey’s career that lives very fondly in Canadian cultural memory. The second is that this production was classic and fun with all the gee-whiz gumption and flashy movement of the most fun things on the festival stage and all the lush costumes and intricate props that set Stratford apart as Canada’s leading company. That said, was it really good? I mean, whatever. 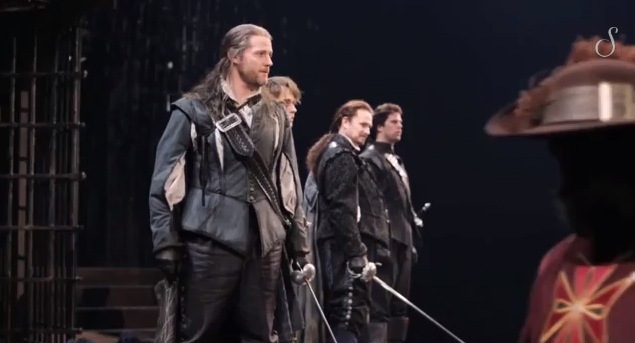 It leant a little too heavily on the sword fights and not heavily enough on its winning titular trio- Jonathan Goad, Mike Shara and Abbey, graduating from D’Artagnan to Athos. The production had some excellently funny moments (season standout Antoine Yared was a highlight as upstart servant Planchet) but generally there was a lot of flash and not that much serious storytelling. The saving grace was the superb chemistry between the Stratford heavyweights playing the veteran Musketeers. Shara was as delightful as always as the poet Aramis (though a little underserved by the somewhat sparse role) and Goad gave a go-for-broke physical comedy performance as the portly Porthos. Abbey, obviously, proved a charisma machine as their enigmatic leader. But what I liked most about the trio was actually a sort of meta element that only existed at the particular performance I attended. Stratford up-and-comer Luke Humphrey was out unexpectedly and his untested understudy was performing for the first time. Faced with a massive role in a massive production on the biggest stage in the country, Andrew Robinson brought a thrilled energy to D’Artagnan that actually was really fun to watch. At times he looked utterly terrified (which is in character) and he screwed up more than once (also in character) but he muddled through excellently and that naive desperation to prove himself actually made D’Artagnan’s arc all the more compelling. Goad, Shara and Abbey, for their part, spent three hours playing mentor to the new kid trying his best to follow in their footsteps (how apropos). They laughed off line fumbles, shrugged when their cues were stepped on and, come curtain call, three of Canadian theatre’s biggest names stepped happily aside and led the applause for Robinson and how thoroughly he had stepped up to the plate. It was a truly remarkable dynamic, one that only that one audience had the privilege to see in full force. It got to the heart of what The Three Musketeers is all about- not witty barbs and flashing steel but the essential essence of “All for One, and One for All”. *Note: due to a family emergency, I was unable to make it to Stratford to see the final two plays of the year, The Thrill and Teaching Shakespeare. I don’t know anyone who saw the former but I heard excellent things about the latter. The Walking Dead 404 "Indifference"